Not perfect, but so much fun. This one is so much fun and I don’t need to write down the full recipe. *yeah* Gingerbread houses seem to be a must over here. We have them too back home but over here it’s a bit more crazy. Everything seems to be a bit bigger or crazy over here. The other day I even saw an already full assembled gingerbread house. You only need to put on the candy. But how much fun is that? 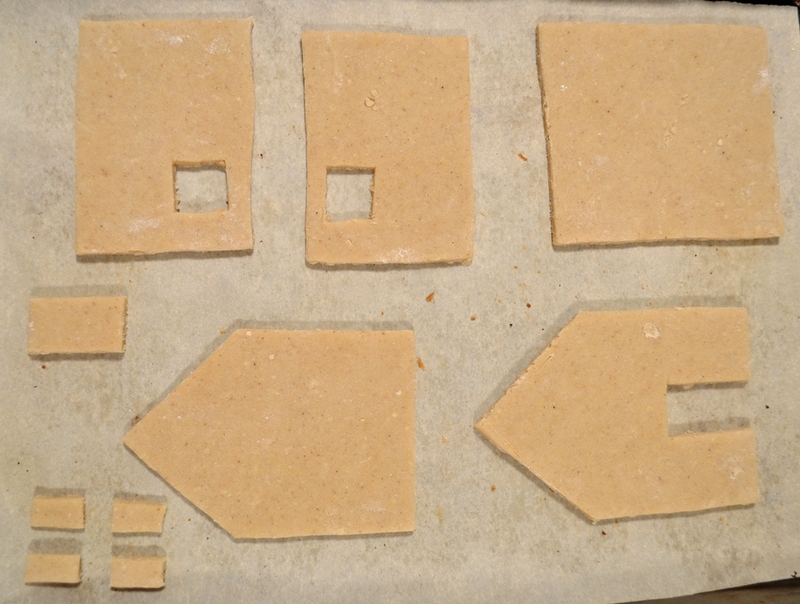 Isn’t it much cooler to make the dough and cut the shapes and put it together to finally decorate it? If you would like to do so with your kids (or by yourself) then keep reading. Take the recipe from “Gingerbread cookies” and make the dough. I recommend you let it stand for a week or so, the dough will be much flavourful. While waiting for a week you can make stencils. I highly recommend this so that your walls and so on are straight and fit each other. 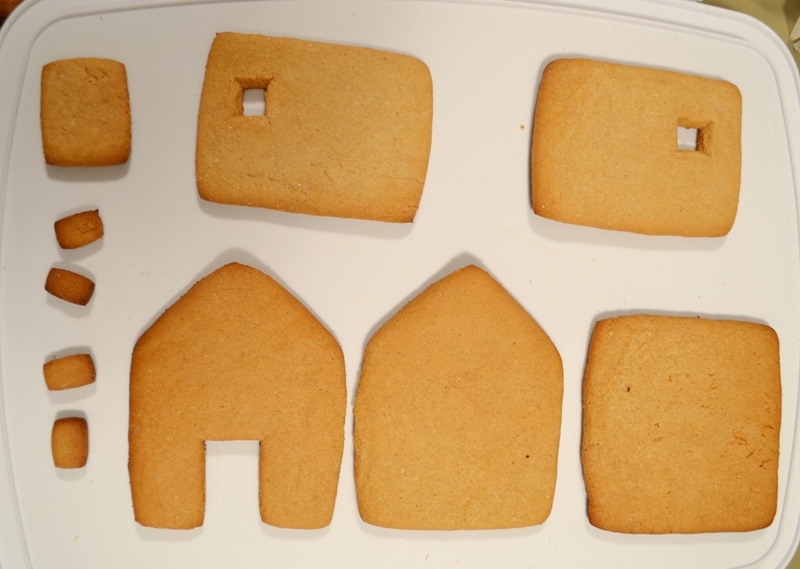 There is a nice one over at the Saskatchewan German Council webpage: Shapes for Gingerbread house. This might be a bit too big for the regular amount of dough, but you can always a) make more dough or b) reduce the size on the stencils. I also saw gingerbread house cookie cutter at Wiltons: look here. Don’t forget to make a base for your house. Hand cut, it looks straight, it’s not really. But honestly, isn’t it more fun to cut them yourself, even free handed. Makes it of course a bit crooked but it has so much more character. Unless you need like 20 and then you better get that cookie cutter. Bake the cuts according to the recipe and let them cool. Now you want to put them into a tin with a piece of bread so that they are a bit soft. No one wants to year a hard gingerbread house wall. If you need to speed up things use a slice of apple and they soak that moister right out of there. Just make sure it’s not all too soft, otherwise you might have a structural problem. After baking: you can see it’s all a bit more round, cut off the excess. For glue I used meringue which I made while making Cinnamon stars. Whip the egg whites very well until very stiff. Now slowly add the icing sugar and whip on high. A nice and stiff consistency will give you better “glue” and it won’t run all too much. Take the base and now it’s assembling time. You might want to have some glasses or cans read to help you. Another pair of hands isn’t all to bad either. I started with both sides, glue on the bottom, stick them on the base and stabilize them with whatever you like. Once they are dry you can add the front and back. Glue on the bottom and on the side and stick them as straight as possible on the rest. You might want to fill any holes with icing. The most tricky part is of course the roof. But as with everything else, glue on all ends and put it on. If you are lucky it won’t move and dry by itself, otherwise find something that will stabilize it, or hold onto it until mostly dry. Candy corn & Smarties for my house. Now I would recommend a drying time of an hour before you proceed to decorating. This could be very hard for the kids but you could read a Christmas story or have some play time while waiting. Decorating is the most fun part because everyone can go wild. I like structure but the kids probably like the “as much candy as possible on there” way more. 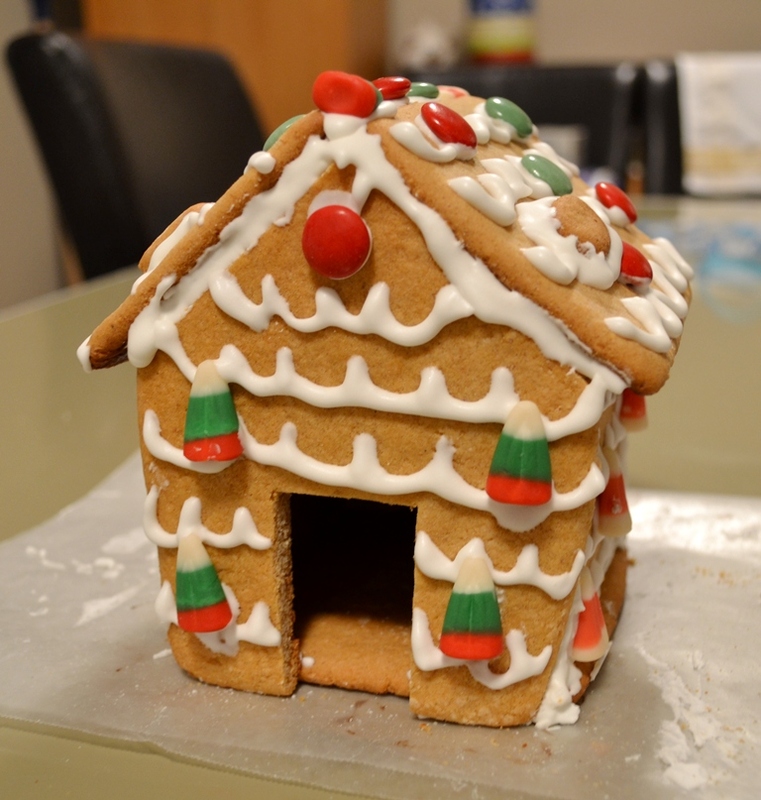 And for the more elaborated baking, look on Food bloggers of Canada, there you can find a tutorial for Gingerbread house covered with fondant. This is not really for the little ones and I am not if I would attempt this, ever. I had so much fun doing this. Hope you will too. 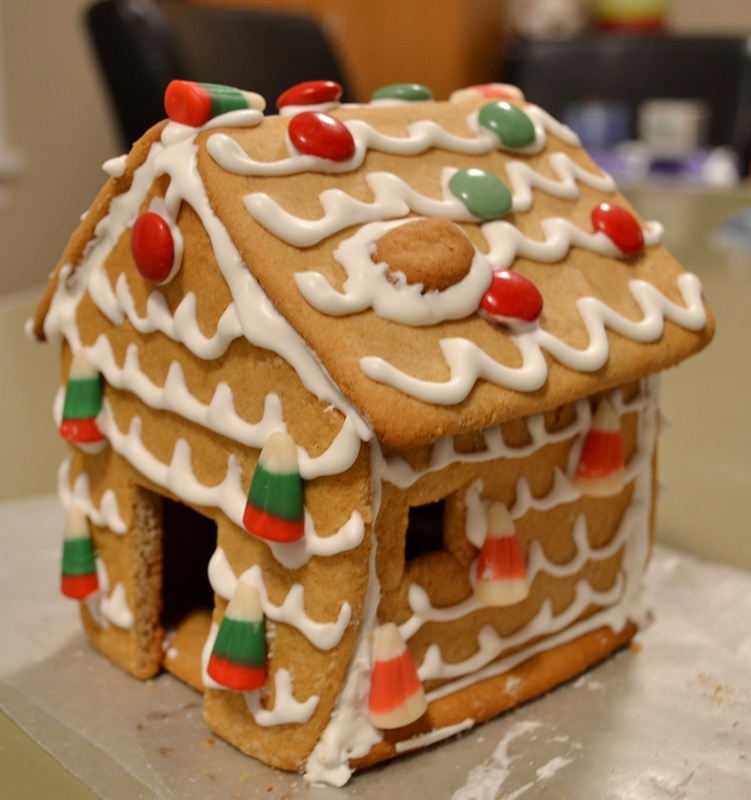 After decorating your house, let it sit for a while before either munching on it or wrapping it up to give to someone. I made three houses for a bake sale and they went quickly. 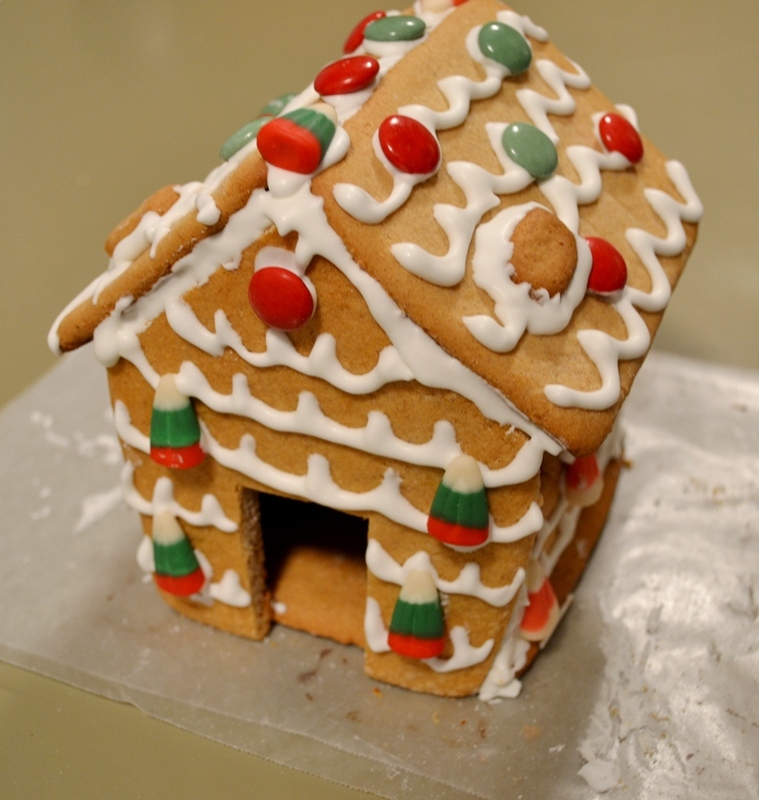 Posted in Cookies, Holiday and tagged baking, Christmas, gingerbread, gingerbread house, recipe. Bookmark the permalink. That is a very tasty and impressive gingerbread house. Look forward to more.